This midway post is part of the Social Justice Book Club, and may contain spoilers--in so far as there can be "spoilers" for a non-narrative non-fiction book like The New Jim Crow. All are encouraged to participate in discussion here or on their own blogs, whether you're reading along with us this month or not! And it's not too late to sign up if you want to "formally" join in. 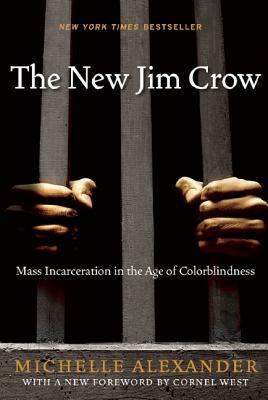 Well, friends, we made it this far: three chapters into The New Jim Crow. I don't know about the rest of you, but I didn't know it was possible to write "They can do that!?" in the margins of one book so many times, over and over and over again. I definitely expected this book to turn many of my assumptions and pre-conceived notions on its head--even going into it believing, fully, how racist our current criminal justice system is--but this is above and beyond. In 1964 (! ), West Virginia senator Byrd is quoted as saying, "If [blacks] conduct themselves in an orderly way, they will not have to worry about police brutality." That was a full fifty years ago, folks. And we're still having the same discussion today. At the time that the War on Drugs was declared by President Ronald Reagan (1982) less than 2% of Americans thought drugs were the most important issue facing the nation. Public fear of drugs--particular crack--was carefully crafted by a media campaign spearheaded by the government. Whoa. Let that set in for a moment. "There are more people in prisons and jails today just for drug offenses than were incarcerated for all reasons in 1980... The vast majority of those arrested are not charged with serious offenses." Police systems are financially incentivized--by both federal grants and by being allowed to keep seized possessions--to participate in the drug war. Seizure of property is based only on "probable cause," and "neither the owner of the property nor anyone else need be charged with a crime, much less found guilty of one" for said property to be subject to forfeiture. What in the actual hell. The Supreme Court has ruled that those who cannot afford legal representation are entitled to counsel. According to Alexander, approximately 80% of criminal defendants cannot hire a lawyer. But that doesn't mean they get state-appointed counsel, or that if they do, that it does them any good. Virginia caps fees paid for representing someone whose sentence is less than twenty years at $428 (which is approximately, what, 30 minutes of lawyer time?). Wisconsin decided that anyone who makes more than $3,000 year can afford counsel (what planet is Wisconsin even on?). Studies have shown that 30% of released prisoners are re-arrested within six months of release; that number skyrockets to 68% within three years of release. The Supreme Court has all but made it impossible to contest a sentencing decision and/or jury pool on the basis of racial discrimination unless a prosecutor openly admits to racial discrimination--which they are highly unlikely to do. 1) Alexander writes in the introduction that she consciously chose to focus her writing on African American men--though she recognizes that the criminal justice system can have even harsher consequences for women (particular women of color) and Latinos. 2) In Chapter 1: The Rebirth of Caste, Alexander writes "...eliminating "savages" is less of a moral problem than eliminating human beings, and therefore American Indians came to be understood as a lesser race--uncivilized savages--thus providing a justification for the extermination of native peoples." (23) How much, if at all, do you think this same explanation can apply to modern-day murders of black people, in which a victim's criminal record, physical appearance, and/or attitude towards police officers is used as a "justification" of that person's killing--both by police and by those defending them? 3) Writing about the birth of Jim Crow, Alexander reminds us that it is difficult to remember that "alternate paths were not only available at one time, but nearly embraced." (35) Does the same apply today? Are there alternate paths we could have embraced in recent history, and/or could embrace moving forward? 4) On the opening pages of Chapter 2: The Lockdown, Alexander writes about the [mis]perception of the criminal justice system, as shaped by popular television shows and movies. The New Jim Crow was written in 2010, before Serial, Making a Murderer, Orange is the New Black... etc. Do you think representations of the criminal justice system in popular entertainment have changed in the last six years? Is that a good thing? 5) From the start, Alexander stated that she aimed to prove that disproportionate rates of incarceration [and/or criminal justice system control] of young black males is not a symptom of poverty, but "evidence of a new racial caste system at work." Based on these first three chapters, do you think she's done as much? Comment below with your answers, or drop a link to your social media or blog post discussions of the book thus far. I can't wait to hear what everyone thinks. And feel free to join in on discussion even if you read the book way back or aren't all the way caught up to the end of Chapter 3 yet!